Akashic records readings allow you to tap into knowledge that you normally wouldn’t have access to. It is said that these records contain all the knowledge of human experience, and the history of the cosmos. In Sanskrit Akasha means sky, space or aether. This term comes from the Hindu mysticism. The Akashic records can be accessed through Reiki. The Hon Sha Ze Sho Nen or Long Distance symbol connects to the Akashic Records and can be used to heal karmic patterns, dis-ease in the body or any mental or emotional pain. There are other ways to access the Akashic records, such as astral projection, and other special states of consciousness induced by meditation, prayer, pranayama, visualization, illness, certain stages of sleep, etc. The concept of having an Akashic record read come in the 19th century and is used widely today. The eighth chakra is incredibly interesting. ... Here one also finds the Akashic Records, the "books upon which is recorded all we have ever seen, done or said, in this life or in any other. Cherokee teacher Ywahoo calls these records "The Temple of Understanding" which contains "....all the programs of our expression in this life and the other lives which are co-existing." (Ywahoo, 106). Because of this, we can gain access to anything about our past through the eighth chakra. ... This chakra is rich in information about our karma, the slate of issues we have come to work out and learnings we seek to acquire Because we record in this chakra information about others and their roles in our lives, it is here we can find many of the cords which currently affect us. We can also trace our patterns (the habitual processes in which we get stuck) through our eighth chakra, making it a valuable access point for healing chronic physical or emotional problems, and difficult relationships. Because it relates to time, many of our issues can be resolved through this chakra." The Akashic Records describe the karmic goals, debts, contracts and life purpose of each soul's many incarnations, including the present lifetime. By using of the Reiki symbol in healing, present life traumas can be reprogrammed so that literally they change the future. Past life patterns can be uncovered and released, and karmic debts resolved. All of this happens in direct hands-on healing sessions, usually in a series of healings." LEARN TO ACCCESS YOUR AKASHIC RECORDS? A brand new program, Read Akashic Records, by master hypnotist Steve G. Jones is designed to teach you how to read the akashic records and give you the knowledge contained in the akashic records. 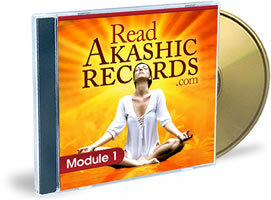 You'll receive 4 audio modules that take you from A to Z in reading akashic records. And to ensure your success even further, Steve is going include a powerful hypnosis recording. You'll go from a novice in reading akashic records to expert.